Here at PGA, we take our boat repairs very seriously. We know how to properly repair your boat without cutting any corners to ensure the highest quality and safety for you and your family. Our technicians have many years of hands on experience. We do it all! From stringer repairs to transoms and small chips, we repair ALL collision related damages. Our paint and refinishing techniques make PGA stand out from the rest. We have a 52' downdraft spraybooth which ensures a clean, superior finish. We also specialize in gelcoat color matching. Drive in or we can lift you out of the water if you don't have a trailer. We are located next to Sun Up Marina on the Salt River. 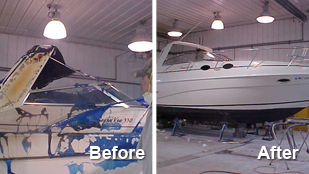 Contact us in New Baltimore, Michigan, to request our accessible boat repair service.